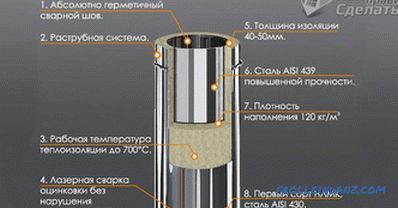 The bedroom is designed for relaxation, and therefore its design should reassure us and promote relaxation. What should you pay attention to when setting up your bedroom? Firstly, the comfort of the bed, secondly, the amount of light entering the room, and thirdly, the color palette of the room. Blue color in the interior of the bedroom creates a natural feeling of coolness and freshness, which helps to sleep well, and the slightly gloomy atmosphere gives the room more depth! 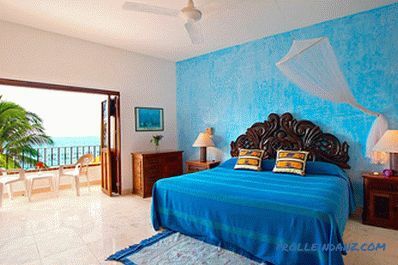 Immerse yourself in the world of these stunning blue bedrooms and swim through the waves of inspiration! Blue shades that look like clear skies inevitably put us in a state of reverie . In the bedroom we need to feel calm and serene, because this is exactly what we need to get ready for bed! If your thoughts are already somewhere in the clouds, make sure that your feet are firmly on the floor of the fabulous blue bedroom! The sky blue bedroom must be well lit! The blue walls “squeeze” the room, and the sunlight will help get rid of this sensation! 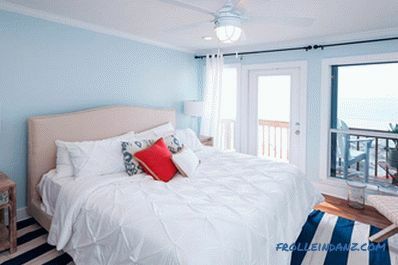 The coastal style bedroom, which combines the brightness of white and the charm of blue, will surely please who dreams, waking up, to imagine that there is a sea, palm trees, sun and eternal summer outside his house window! If you plan to add some elements of chic chebby to the interior of your bedroom, blue the color palette will suit you better than anything! This is a great way to make the room fresh! If you are trying to make your bedroom unlike any other at any cost, we advise you to use a custom-made tapestry for decorating walls. It will become the embodiment of your desires, bringing something exceptional into your magical blue room! Try to draw inspiration from the white and blue interiors of classic Greek houses! The shades of blue used there reflect the enchanting beauty of the sea! 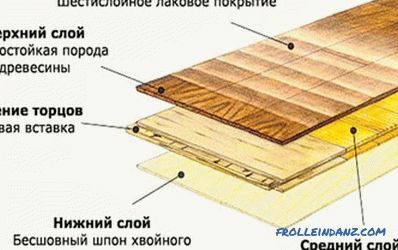 A bedroom, in the design of which only neutral elements are involved, may very soon begin to appear monotonous and cause boredom. The best thing you can think of is that the interior always looks fresh - a light blue wall! Do you want every day to look like a holiday somewhere in the Bahamas ? It is easy to achieve this: you just need to maximally free up space in the bedroom without cluttering it with unnecessary furniture and choose a shade of blue for the interior that will resemble the sky color on a sunny day! White antique bedroom has its own unique character. You enjoy it even when just looking at it! 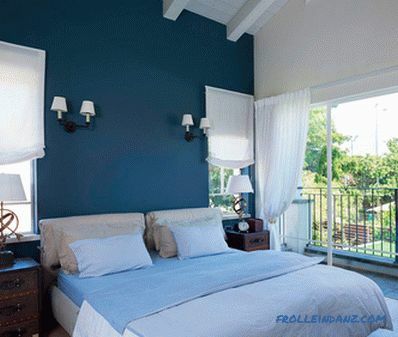 Strengthen the vintage atmosphere of the room by painting the walls in a light shade of blue. The bigger the colors, the brighter and brighter the room will look! In large bedrooms, the feeling of comfort and coziness is sometimes lost. 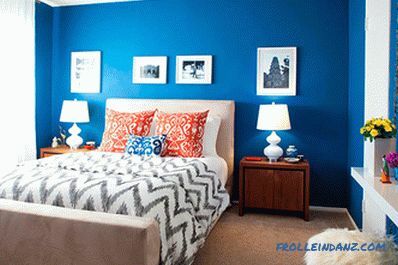 Blue walls will help to rectify the situation - they will visually reduce the room, thereby creating a cozy atmosphere in it that everyone wants so much! 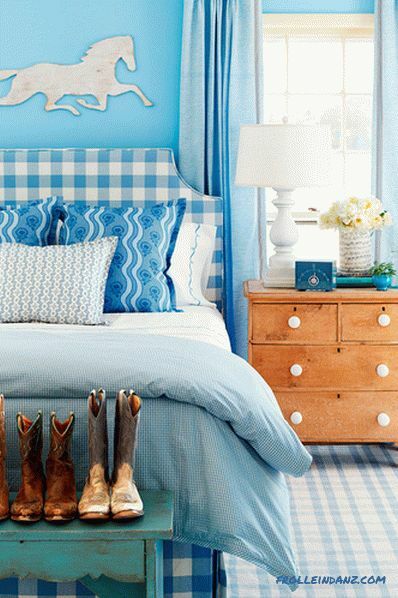 Undoubtedly, the blue bedroom can make an impression. Blue blends well with most colors and can bring new energy to a minimalist interior. Against the backdrop of a snow-white bedroom, seemingly spacious and slightly airy, the blue one looks rather peculiar and somewhat unexpected! 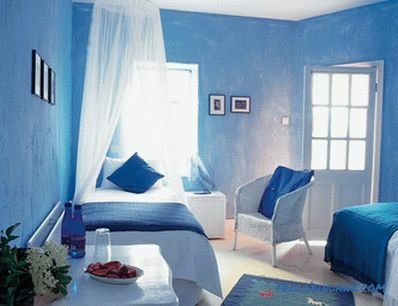 There is no need to unnecessarily furnish a bedroom with radiant shades of blue. The color scheme itself is able to fill the room and give it a finished look! An elegant blue bedroom, in the interior of which there are white and cream elements, is undoubtedly the embodiment of the philosophy of modern minimalism! A dark blue bedroom with simple shapes is an ideal modern “sleepy cave”. She undoubtedly will appeal to those who want to sleep in a room that creates the feeling of being in the underwater world. To make the interior of your bedroom look really dynamic and diverse, use different shades of blue: dark ones are perfect for the area where the bed is located, while bright ones are more appropriate in the work area ! Let the bold blue color attract attention! 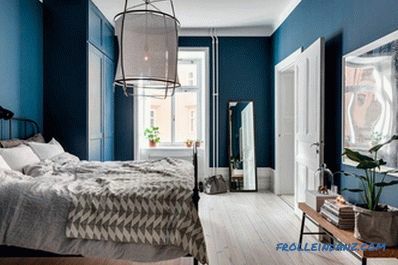 You can play with the decoration of the walls or add some decorative elements, but to achieve a harmonious look, keep the chosen shade of blue throughout the room! 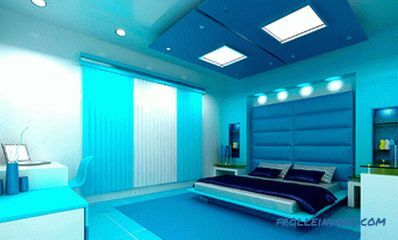 Only bright daylight allows feel the power of blue in the bedroom interior! Strict blue walls are an amazing backdrop for all other elements of the interior and easily distinguish them. Turquoise and cream - a combination that all those homeowners who wish to sleep only in the most stylish bedroom decorated with the latest fashion dream! Blue walls create an attractively mystical atmosphere: it seems that there must be some secrets and secrets in this room. 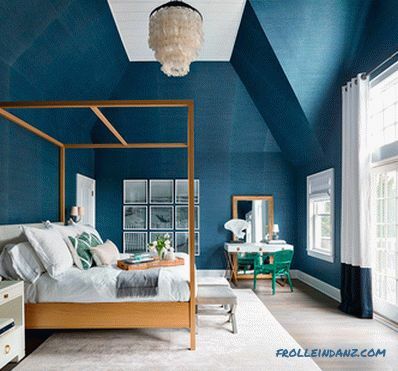 The blue bedroom has a mysterious, slightly gloomy look and is perfect for those who are not in favor of bright colors in a place to relax. 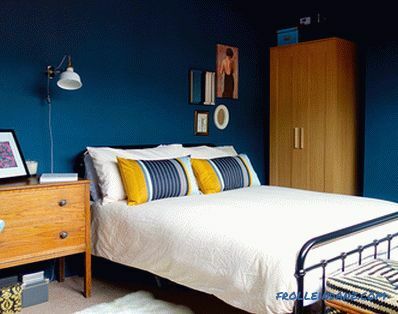 Even on a sunny day, the dark blue bedroom will retain its invariably cool look and a slightly melancholic atmosphere! 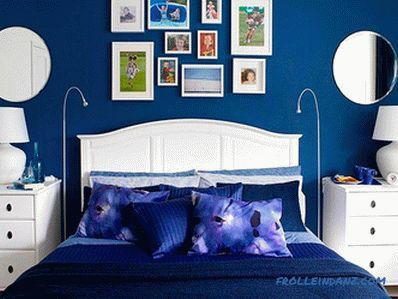 Dark blue walls give a small bedroom meaning and meaning! The whole room looks resolutely and incredibly stylish! Want to have a well-lit room that looks cool and fresh? 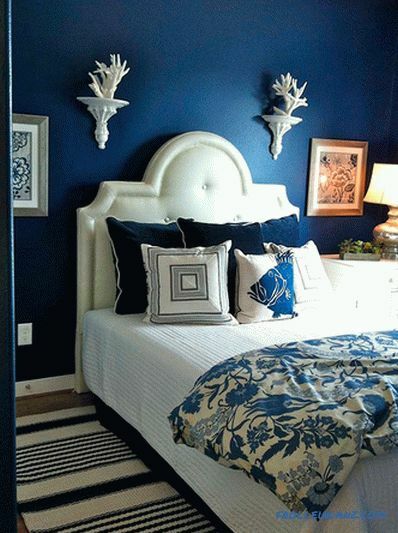 Paint the walls of your large bedroom blue and with them a slightly dark atmosphere will appear that balances the brightness! 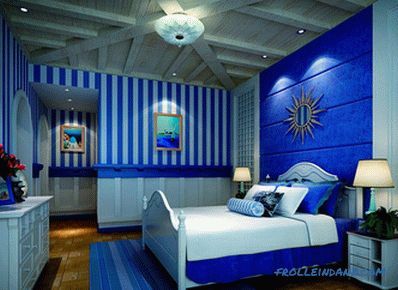 The bedroom with indigo interiors has a special charisma and is ideal for who does not like excessively bright rooms and feels fine only in a "muffled" atmosphere! Choose the elements of decor that are suitable for a room with indigo walls to create a complete view of the sleeping area! 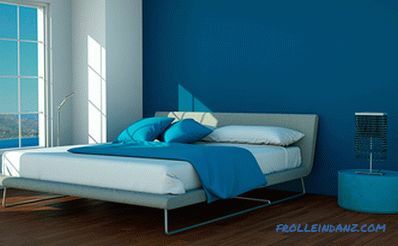 Against the background of the blue wall, the wooden bed and various interior elements of light beige shades look great. This is the perfect balance between darkness and light! One of the main advantages of blue is its ability to blend with other colors, both warm and cold. 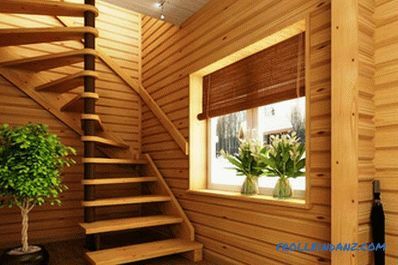 Balance the excessive brightness of the blue color with warm colors of wooden furniture. 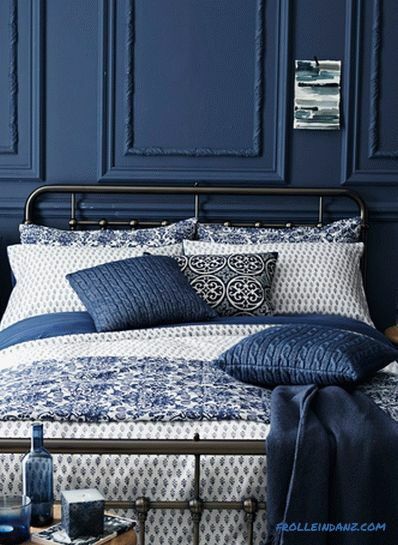 Indigo color may be associated with a modern interior, but in fact it is a great way to liven up a traditional bedroom and create a feeling of progressiveness! 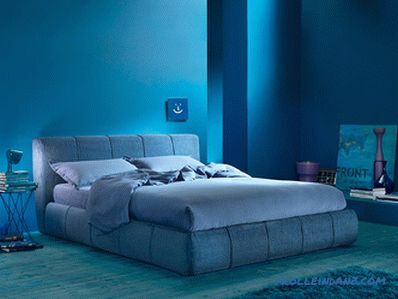 Blue, which always seems unusual and mysterious, is the best way to create a feeling of mystery in the bedroom! 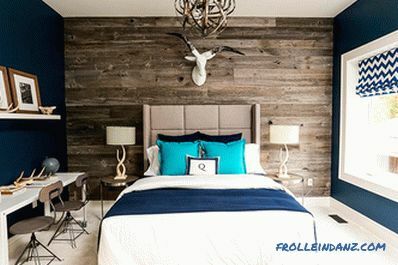 Combination of dark blue walls with “rustic” interior elements in this the room is just mesmerizing. 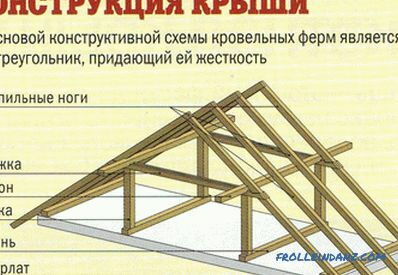 Perhaps in the future it will look like bedrooms in country houses. A spacious room with high ceilings can look quite frightening if you prefer cozy and comfortable living spaces. 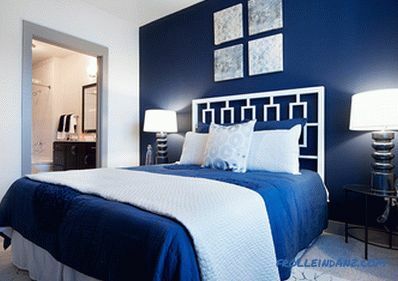 The blue walls will help you create an atmosphere of calm in the bedroom, and the room will look like a very large, but still cozy little place! 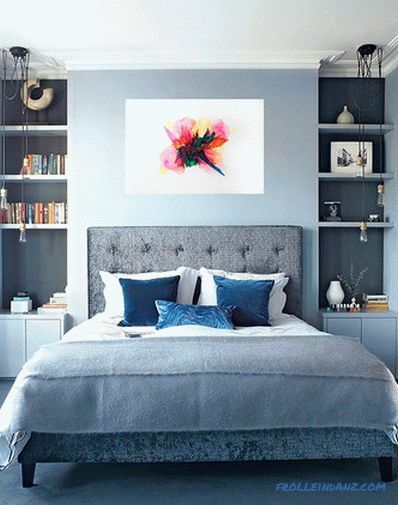 Decorate your blue bedroom with a mini gallery that will stand out on a dark background and give the space where you plunge into the world of dreams, the element of individuality! 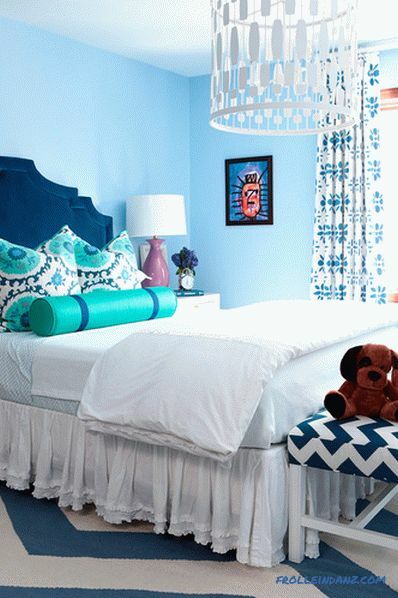 The blue bedroom is not created solely by painting all the walls blue - you can paint only one of walls, and then coordinate with her several decor items to achieve the desired effect! 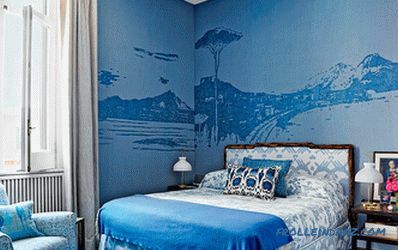 Blue in erere bedroom creates a feeling of absolute freedom! Although this room is far from being called the largest in size, it gives the impression of spaciousness. The room looks like a modern beach house with an excess of dark charisma. 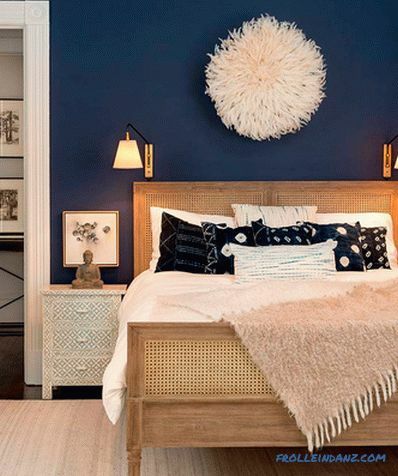 The contrast between light and dark is striking in this charming blue bedroom, which demonstrates the magic of finding a balance between the two parts of the color spectrum. Finally, you will get the opportunity to enjoy both!